This was another low mileage week as far as miles go. I am maintaining my base and getting in some quality miles, however. On the plus side, we have had some unusually cool weather for early August (including several days of rain) which made running at a quicker pace than normal a lot easier. However, I am battling a growing injury though. I am on the verge of having a full-on calf strain, so I am trying not to aggravate that. I remember this past spring it started out pretty mild and eventually if I don't baby it, it will grow into an injury where I cannot run. On the plus side, however, I am coming up on a 2-week vacation and I suspect I'll be doing a lot less running than usual. This will hopefully give my body a chance to recover from what I am putting it through. I also did go to the doctor's on Thursday. Nothing jumped out but I did have blood drawn and that should reveal why on many days I feel extremely lethargic and drained. I've noticed that more often than not it is midweek, rather than on the weekends. I should know something more by next week. There are a bunch of races held locally this coming weekend. I haven't picked one out yet (if I do race at all). There are also some races in the middle of the week. We shall see how the week goes and how aggravated my calf gets. I don't want to have to go through that injury again. I also don't want something long-term that ruins my opportunity to run well in Vegas in November. On my long run on Tuesday I spotted this horse along the bike trail. 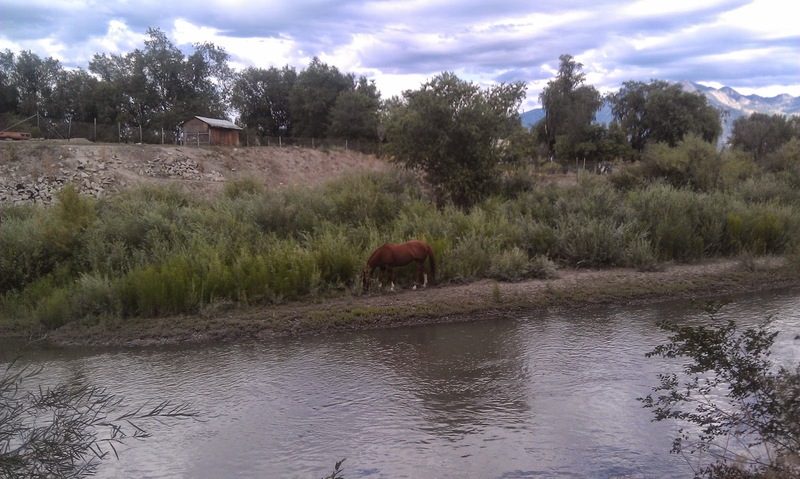 Normally I don't see horses that close to the Jordan River but this one had obviously wanted to get close to the water. I spotted the horse in Taylorsville and while Taylorsville isn't exactly known for being rural, this stretch of trail seems to have some farms and corrals.